Installed a 3" body lift over the weekend. Now got to figure out why I've got a Stabilitrak and Traction Control error. Thinking maybe a bad ground - had to remove a few and maybe I didn't get one put back good. Replaced the water pump and thermostat in Tonka yesterday. What fun. Does anyone know how to get that blue gasket sealant off your fingers? Installed a Chrome Tail gate handle and Bezel. Not the cheap stick on kind. What a pain!!! Reinstalled my light bar after some modifications and a trip to the powder coater. WTH? What happened... did work let you out early for good behaviour? Left it abandoned in the drive and took the bike to work. It might get a good spring detailing tomorrow morning before we take off on the bike though. So, what did you run? My best was 82 MPH / 16 Seconds for the 1/4 mile. 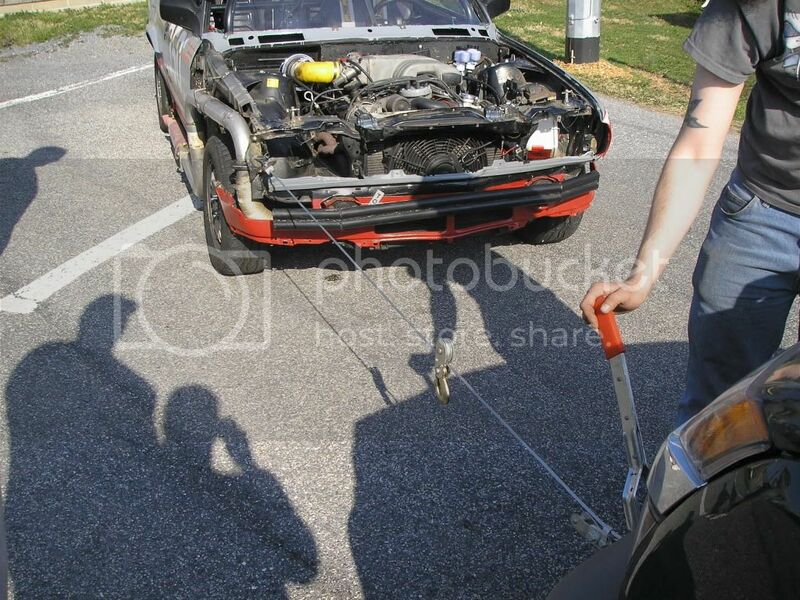 Used it as an anchor to straighten out the body and exhaust of our 24 Hours of Lemons race car. Spring cleaning, getting ready for Vermontville this weekend. :B:Spent the last 3 days (spare time) sanding and painting my mud guards with fusion. That rough finish is not easy to sand. I could rob a bank and no finger prints. Finally finished up a big job for a "blue hair" she was a sweetie and gave me a nice tip "to get some pancakes and beers with your Avalanche friends" at Vermontville Syrup Festival. MMMMM Pancakes and Beer!! lol!!! I can tell you what I didn't do - Install one of these: N-Fab Pre-Runner Bar. Been on order for 6 weeks and still waiting! 3 weeks ago I called and asked if they could expedite - I was going to need it this weekend. "No Problem" dey sez. Should ship on the 20th. "Great" I sez. Called last week. "Ya, No Probla Mon!". Call today "Um, it's going to be at least another week to finish + shipping time." It's a little late, but this weekend I had the stock muffler/resonator cut out. I installed a Flowmaster 40 series with a 4" tip. It sounds AH-MAZE-ING!!!! !